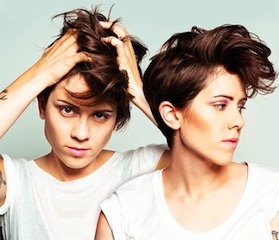 Tegan and Sara scooped three awards at the 2014 Juno Awards this past weekend. The Canadian indie/pop duo's seventh studio album, and commercial breakthrough Heartthrob, earned them their first three Juno Awards - Pop Album of The Year, Single of the Year ("Closer") and Group of the Year versus fellow artists such as Robin Thicke, Arcade Fire, Michael Bublé, and more. Tegan and Sara will be kicking off their "Let's Make Things Physical" headlining tour this spring with dates including a stop at NYC's Hammerstein Ballroom, and back-to-back nights in DC and Chicago in addition to some massive performances at slew of summer festivals, all followed by a stint with Katy Perry on fall's "Prismatic" tour. All dates can be found below.